One of my favorite go-to meals is Calzones. They are so quick and easy, tasty, and the possibilities are endless. That being said, I always made the same ones over and over again. Pepperoni, Sausage or Ground Beef/Bacon - just like we like our pizzas. Recently I purchased a Groupon for a discounted subscription to emeals. Emeals is a service that sends you a weekly meal plan, complete with shopping list, based on your preferences (vegetarian, portion control, paleo, etc.) and preferred store. I admit that I don't use emeals to the full purpose of it, but for the price I purchased a subscription for, it's a good jumping off point to plan my weekly menu. Honestly, I just have so many recipes I want to try, so many favorites, etc. that meal planning for the week can get difficult. I cannot survive without my meticulous meal plans though, so emeals helps me narrow it down - they tell me to make burgers, OK then I'll make one of the 10 recipes I want to try out! So, long story short though - one day I was "told" to make Taco calzones. Taco calzones you say?! That's a fun new twist! So I did, and we loved them. And just like all of the other calzones I make, they couldn't get any easier, plus they're totally adaptable to whatever you want them to be. We like things a little more "plain" in our house, but I imagine most people would like salsa, sour cream, etc. with these. Cook ground beef. Stir in 1/4 cup water and taco seasoning (2 Tablespoons if using homemade, half a packet if using store bought.. Cook a few minutes and set aside. Roll out pizza dough, divide in quarters. Evenly divide meat, cheese and cilantro and top one half of each dough quarter. Fold over to make a packet, and seal using finger tips or fork tines. Cut slits on the top, and brush with a little olive oil or spray with baking spray. Bake for 20-25 minutes or until golden brown and cheese is melted. Serve hot with sour cream and salsa if desired. These are so pretty! 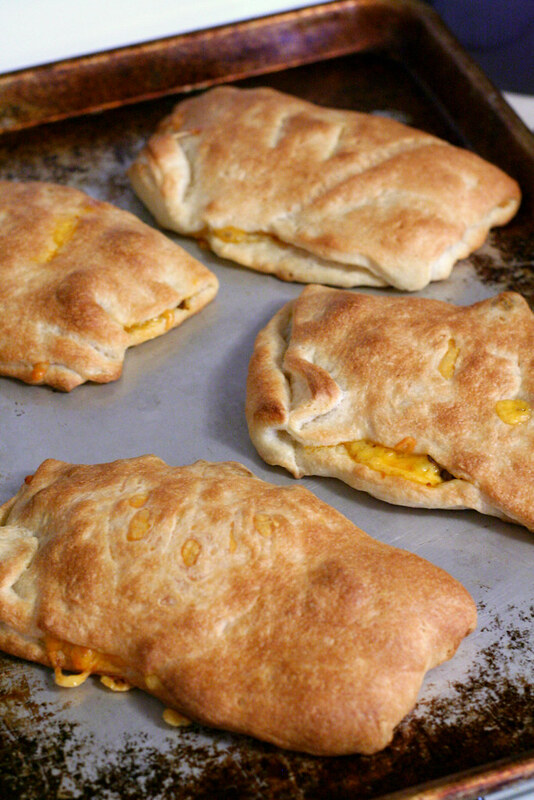 I love the idea of a taco calzone, I am always in the mood for Mexican food. Yum! 2 of my favorite things combined. These look easy for a weeknight, too.